MALIK HOSIER of NEW YORK MERGE COMMUNICATIONS and SHASHIMA MITCHELL of SM WEB DEVELOPMENT complete a new web site design and new media content development. TAYSHANACHICKENMURPHY.ORG was created with an interactive main page, events calendar, news updates, photo galleries, videos, and a blog. TAYSHANACHICKENMURPHY.ORG also has new interactive banner display space and a “DONATE” button linked to a Paypal account page for the foundation. This project is the most important project the company has ever completed. Malik Hosier serves as a member of the board of directors in the position of Director of Technology. 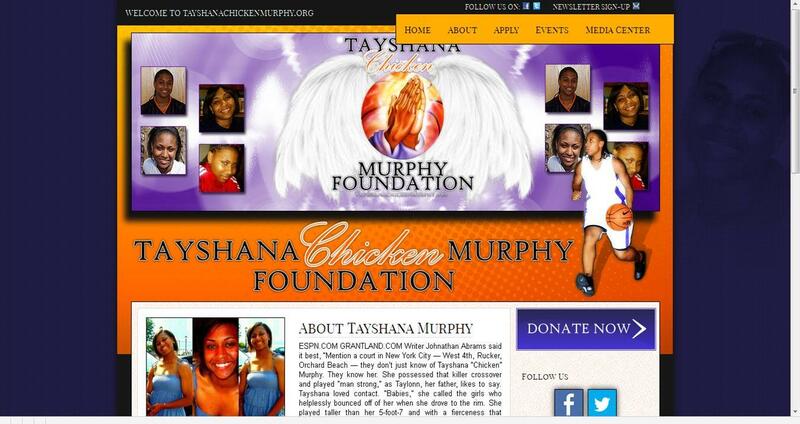 Please contact the Tayshana “Chicken” Murphy Foundation at P.O. Box 25273, Brooklyn, NY 11202 if you would like to sponsor upcoming events. If you would like to volunteer for the foundation or become a sponsor send emails to contact@tayshanachickenmurphy.org. Tayshana “Chicken” Murphy was a great basketball player, a great cousin, and a great young woman. We will all miss you “Chicken”.